WIN ONE OF 50 ATARI FLASHBACK CONSOLES AND GAMES! For every £10 you stake on any ATARI game, you’ll get one ticket entry into the draw. The more tickets you have, the better your chances. You have until 27th November to play and get tickets. 1. Players must be aged 18 or over. 2. This promotion starts at 00:01 (GMT+1) on 20th of November 2016 and will run until 23:59 (GMT+1) on 27th of November 2016 (The Promotional Period). 4. For each 10 EURO wagered on the above games, the player will earn one (1) ticket entry into the prize draw. For example: If a player wagers 20 times 2 EURO on Black Widow Slot within the Promotional Period, the player earns four (4) ticket entries into the prize draw. Winners of the prize draw will be chosen by a random draw administered by Pariplay. 5. 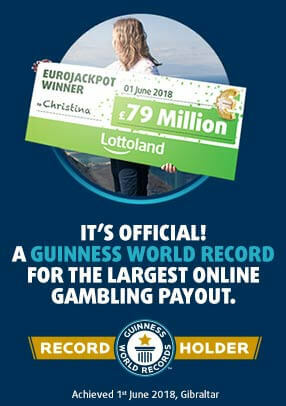 Any winning players will be notified by email from Lottoland within 5 working days of the end of The Promotional Period. After that, the player will have a further 14 days to confirm the relevant contact and shipping address. 6. Please allow up to 60 days for the prizes to be sent from the date of winner acceptance. 7. If a player account is self-excluded or closed at the time of the draw, their entries will be null and void. A redraw will then take place. 8. Lottoland cannot accept any responsibility for any loss, damage or injury suffered by any entrant entering into the Promotion or as a result of accepting or participating in any prize. 9. Winners are liable for any relevant taxes applicable in order to legally claim the prize. 10. Offers cannot be used in conjunction with any other promotion. 11. Any participant found to be operating multiple accounts in promotions will be in breach of these and general account terms and the promoter will determine at its sole discretion by whatever means it deems necessary to establish if different entries or accounts are connected to the same person. Bonus offers are limited to one bonus per person, and/or payment method unless otherwise stated. 13. The decision of the promoter in all promotional matters is final and no correspondence will be entered into. The promoter reserves the right to withhold promotional benefits until resolution of any dispute. 14. The decision of Lottoland Limited in respect of any matter concerning or related to competitions and promotions is final. In the event of a breach of these terms and conditions Lottoland Limited reserves the right to take such action as it deems appropriate in its absolute discretion. 15. Lottoland reserves the right to amend or withdraw any offer at any point for whatever reason. 16. Lottoland Limited general terms and conditions apply. 17. Promoter: Lottoland Limited, Office Suite C, Ocean Village Promenade, Gibraltar (EU).